✔ MULTI-COLORED LOOP CAPS – Set of six glass bottles feature FDA-approved, BPA-free plastic loop caps with silicone lining for leak and spill prevention. Lids come in 6 stylish colors: white, blue, green, red, black and orange. Mix and match with our Glass Bottle Silicone Sleeves – https://www.amazon.com/dp/B01HHWDF00/. ✔ VERSATILE AND EASY TO CLEAN – These reusable glass bottles can store up to 18 oz of water, juice, tea, smoothies, kombucha, cold coffee, and other drinks. Feature larger-than-average mouth opening for easy fill and refill. Bottles and lids are dishwasher safe. ✔ SAFE AND CLEAN DRINKING – Clear glass water bottles are made from premium soda lime glass. You are assured that your glass drinking bottle is BPA, Phthalate, PVC, lead, and Cadmium free. ✔ MEASURING LINE – Bottles has measurements which shows how much liquid is in the bottle. The measurement marks keep track of how much liquid you have consumed. ✔ PERFECT FOR ALL KINDS OF ACTIVITIES – Suitable indoors and outdoors. 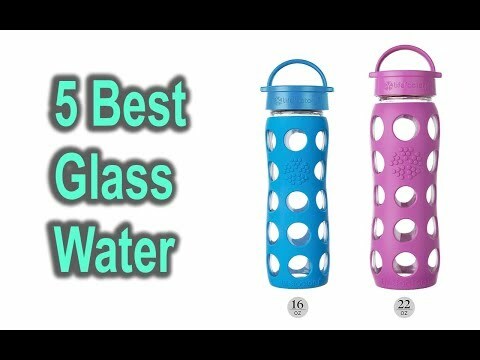 These glass beverage bottles are convenient to use at the office, gym, or even at home. Or bring them with you when you go hiking, camping, jogging, traveling and more. Perfect for people on the go. Just easily clip the loop cap to your bag or backpack. Water-tight and leak-proof lid prevents messy spills.